Our spring gardens were planted early April and are thriving!! But now it is time for us to begin planning our summer container gardens! We love working with our clients to plant them stunning gardens that will make their properties pop! We love to play with different color schemes and work with different plant varieties. Our passion is to beautiful spaces with greenery and pops of summer colors! Here are some awesome container gardens for inspiration!! Oh coleus, how we love you!! I love the pops of purple that accent the lime green! Isn't this just so lush!?!? Love the idea pf using the ficus burgundy (rubber plant). 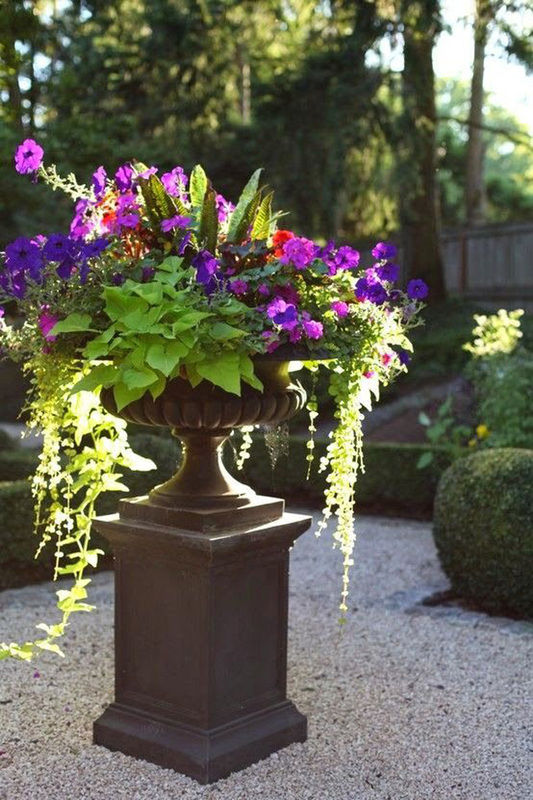 Such stunning urns and color combination!